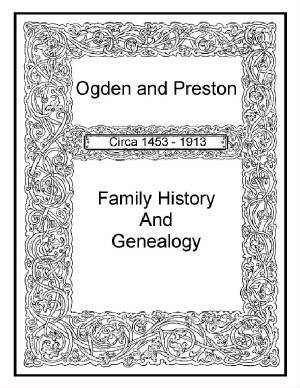 The following families have genealogy eBooks on this page: Grazebrook, Hall, Hamlin, Heydon, Hilligoss, Lloyd, Moffat, Ogden, Powell, Pritchard, Stepney, Temple, Townsend, VanDyke, Viets, and Watson. Welcome to Bookshelf 10 at Hawkeyes Trading Post! 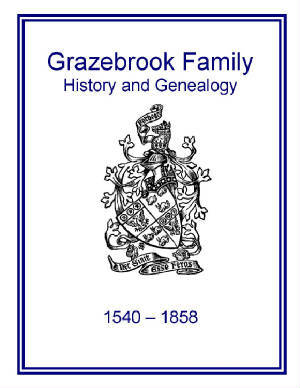 Grazebrook Family History and Genealogy. PDF eBook English and Olde English 2.83 MB. 1878. This book has an extraordinary accumulation of many old English wills, and numerous extracts from many Parish Registers, which provide authentic listings of births, marriages, baptisms, et cetera with detailed references! The eBook also contains old Charters that date back to 1348, with essential dates of Grazebrook family members from the years 1540 to 1858. Fascinating Olde English dialect is contained in the 14 century charters! A treasure of information for the Grazebrook family genealogist! Price $6.95 USD. Hamlin Family History and Genealogy or The Hamlin Family. PDF eBook English 477 KB 1915. This eBooks recounts the Hamlin family origin in France prior to immigration to England around the year 1080. The family then journeyed to the American colonies in 1640. Only 12 pages in length, detailed essential dates with descendents are compiled for the years 1640 up to 1881. 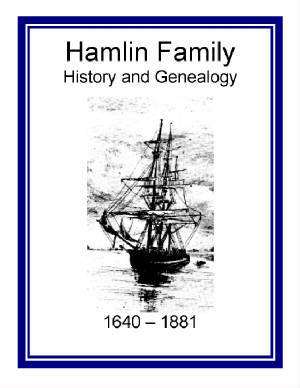 A great resource for the Hamlin family genealogist! Price $6.95 USD. Hilligoss Family History and Genealogy or Hilligoss Family of Pennsylvania, Kentucky, and Indiana. PDF eBook English 2.18 MB. 1904. Likely by the use of lamp light, or candle light, this publication is written by hand on lined paper well over a hundred years ago! 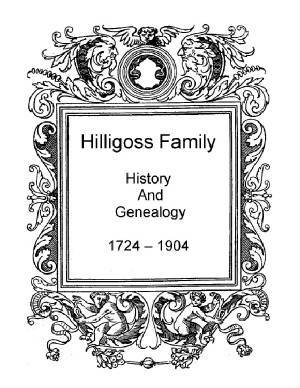 Details of the Hilligoss family are provided that stretch from the year 1724 to 1904. Written in a delightful narrative style, there are short biographies presented with the authors humble hope that the information may be preserved for future Hilligoss descendants. A wonderful source of documentation for the family genealogist! Price $6.95 USD. Moffat Family History and Genealogy or Descent from Reverend John Moffat of Ulster County New York. PDF eBook English 9.77 MB. 1909. 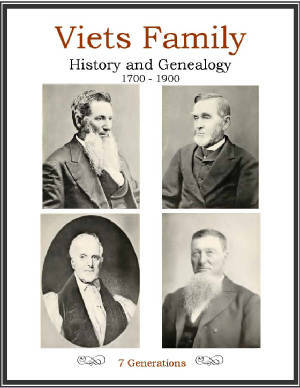 There are 7 generations of Moffat family members referenced in this eBook that extend from the year 1788 up to the year 1908. 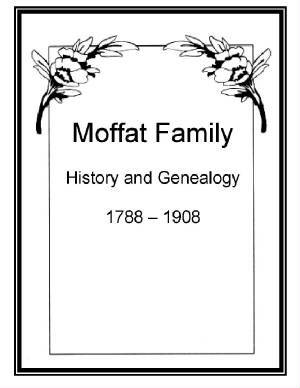 An index of 12 pages provides a listing of over a thousand Moffat family members during this 120 year period! An outstanding reference for the Moffat family genealogist! Price $6.95 USD. 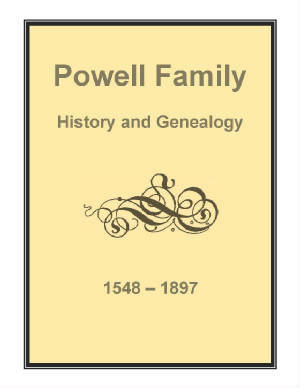 Powell Family History and Genealogy or The account of T.W. Powell and his wife M.E. Powell and their ancestors. PDF eBook English 8.86 MB. 1903. In the story book format the author provides journal entries containing detailed information of daily events and travels across, England, the Eastern United States, and Canada. Short biographies, many letters, and diary notes accompany the vital dates of family members that extend from the year 1548 to 1897! A delightful tale of the Powell Family with an abundance of essential genealogical dates throughout the nearly 350 year period! Price $6.95 USD. 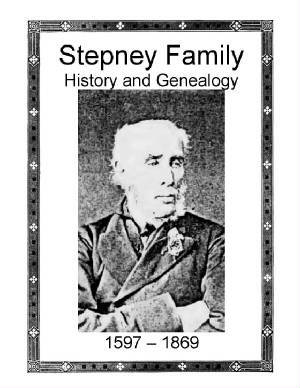 Stepney Family History and Genealogy or Some Notices of the Stepney Family. PDF eBook English 6.65 MB. 1871. Numerous short biographies, poetry, many Stepney family letters, certificates of Army commissions, and tombstone inscriptions can be found in this remarkable publication! Essential dates range from 1597 to 1869, and provide over 270 years of vital dates for many Stepney descendants during this time period. A great source of genealogical information! Price $6.95 USD. Townsend Family History and Genealogy. PDF eBook English 6.26 MB. 1909. Short biographies of Townsend family members, with at least 4 generations from John and Jemima Townsend are contained in this notable family eBook! A multitude of essential dates that extend from 1743 up to the year 1906 are joined with a dozen index pages containing over 1,200 family members! 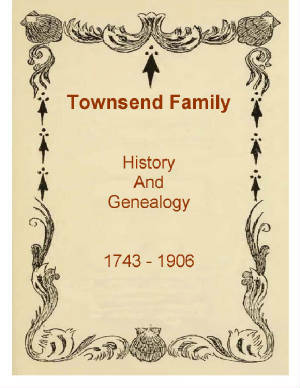 An excellent resource for Townsend family genealogy with compiled information starting from over 260 years ago! Price $6.95 USD. 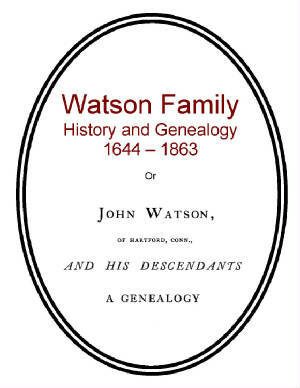 Watson Family History and Genealogy or John Watson of Harford and his descendants. PDF eBook English 917 KB. 1865. The Watson family history begins with the legend of John Watson who jumped overboard to save the life of Peggy Smith, while they were both enroute to the American colonies. A meeting of fate, they were later married in New England. There are 8 generations of Watson descendants, compiled from the year 1644 to 1863, from this one adventurous couple! A great resource for linking past generations before 1863 to the present day! A wonderful source of documentation for the family genealogist! Price $6.95 USD. Hall Family History and Genealogy or Ancestry of descendants of Edward Hall. PDF eBook English 2.88 MB. 1892. This eBook recounts the journey to Ireland of the author to extract family history from Irish records. Other journeys are also described with deeds, tombstone inscriptions, and biographies compiled. 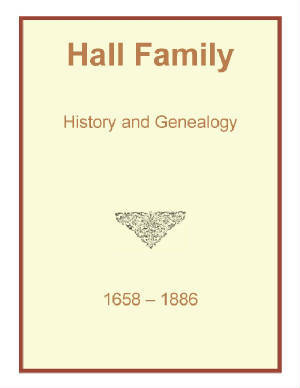 The essential Hall family information extends from the years 1658 to 1886. This is an excellent resource full of kindred information! Price $6.95 USD. Heydon Family History and Genealogy or The Heydons in England and America. PDF eBook English 2.13 MB. 1877. This charming family history includes the legend of the family name which originated in England around the year 1185. Short biographies, and tombstone inscriptions, accompany the 1581 legend of Hayden Hall in England. 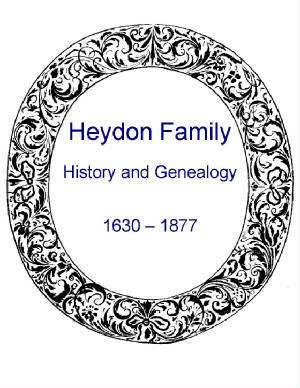 Essential dates extend from 1630 to 1877 for Heydon family descendants. A treasure of information from the authors research in the British Museum! Price $6.95 USD. 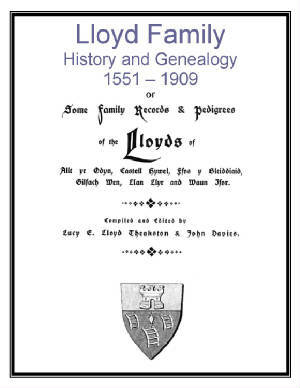 Lloyd Family History and Genealogy or Some Family Records and Pedigrees of the Lloyds. PDF eBook English 12.0 MB. 1313. A very comprehensive account of the Lloyd family history in Wales with Welsh history back to the year 843 A.D.! There is a 12 page index to Lloyd family records with copies of wills, deeds, and pedigree charts included! Essential dates are given for the period 1551 to 1909 for many descendants, and some of the documentation is in Olde English text. A real treasure of genealogical information! Price $6.95 USD. Ogden and Preston Family History and Genealogy or The ancestors and descendants of Captain Benjamin Stratton Ogden and his wife Nancy (nee Preston) Ogden. PDF eBook English 1.59 MB. 1914. This branch of the Ogden family extends back to the year 1453 in England! The first Preston ancestor in America was Roger Preston, a tanner, born in England in 1614! There are up to 10 generations compiled of family descendants with essential dates that extend from the year 1610 to 1913! Over 300 years! This reference may detangle relationships from past centuries! Price $6.95 USD. 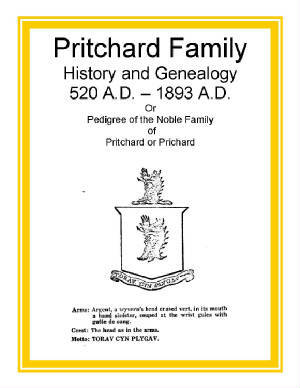 Pritchard Family History and Genealogy or Pedigree of the Noble Family of Pritchard or Prichard. PDF eBook English 329 KB. 1915. This eBook presents important Pritchard family members throughout British history from the year 520 A.D. up to the year 1893. The genealogy is only 6 pages in length, yet this publication allegedly provides a direct descent of the Pritchard Family Nobility for over 1370 years! This great reference may feature rare genealogical information not found elsewhere! Price $6.95 USD. 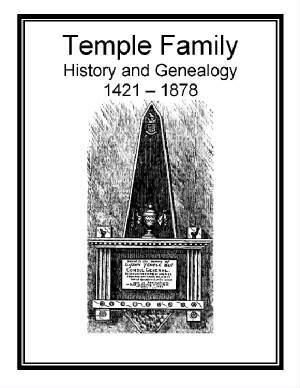 Temple Family History and Genealogy. PDF eBook English 4.90 MB. 1887. The tales of ancient England, of over 5 centuries ago, can be heard in the pages of this eBook as the story of Temple Hall becomes inherited by Nicholas Temple. The legend of the family origin is described in this publication, which dates to the Saxon Earls of Mercia! Essential dates are given from the period 1421 up to 1878 for many Temple family ancestors! If you are a Temple family member this genealogy may be yours! Price $6.95 USD. 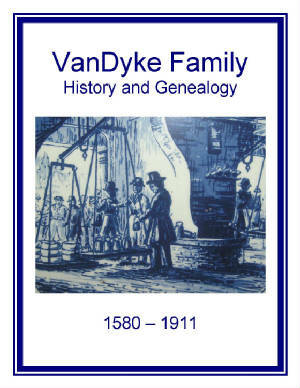 Van Dyke Family History and Genealogy or The Raritan notes on a river and a family. PDF eBook English 6.65 MB. 1915. The family was not originally of city extraction in the Netherlands. Early family members had lived out by the dykes and had taken a name from them. Such was the case with Thomas Janse or Jan Thomaszoon Van Dijk. Essential dates are given for many descendants from the year 1580 up to the year 1911. Charming descriptions of the Netherlands of ancient days with extraordinary genealogical information for anyone in the Van Dyke family! Price $6.95 USD. Viets Family History and Genealogy. PDF eBook English 11.4 MB Year 1902. The legend of the family name is of the high German dialect from the 10th century. This eBook contains many rare ancestral photographs, the family Coat of Arms, an index of 28 pages, and 7 generations of detailed biographies and extraordinary family stories. A source of essential genealogy that may be unique to this publication! Price $6.95 USD.